Our eyes and solar panels have something in common: they receive the most intense sunlight when they are directly facing the center of the sun. Bad for our eyes, but good for solar panels. As soon as either is tilted away from the sun, intensity decreases. The angle between the sun and a single point on the earth changes as the earth rotates throughout the day. This angle is most direct at solar noon. Imagine the continental United States as one giant solar panel: in the morning the sun hits the panel at a very low angle, at noon the angle is directly perpendicular, and in the evening the angle is very low again. A solar panel would be at maximum production at solar noon on a clear day. 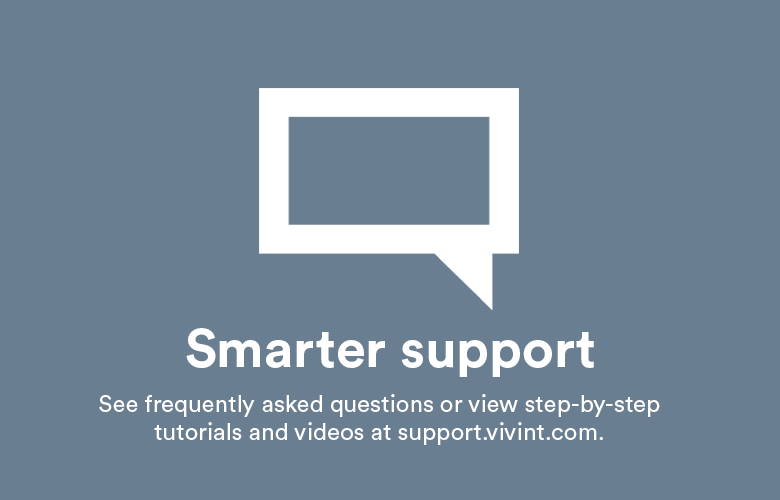 Furthermore, the earth ”tilts” back and forth as it travels around the sun. 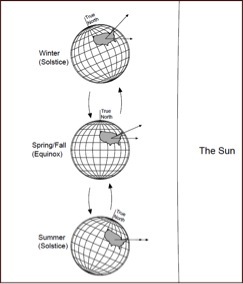 When the North Pole is tilted away from the sun, it is winter in the northern hemisphere. It is summer in the northern hemisphere when the North Pole is tilted toward the sun. The angle between the solar panel and the sun is the greatest in the winter, resulting in less direct sunlight and lower solar intensity. In the summer the angle is much more direct and the solar panel receives more solar intensity. 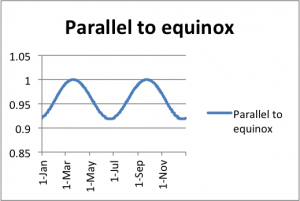 We can conclude that a solar panel would be at maximum power at noon in the summer, and it would be at minimum power in the winter in the morning or evening. (Ok, minimum power would actually be in the middle of the night when there is no sun at all, but you get the idea). A solar panel laying flat at the equator would be at maximum power when it is directly facing the sun. 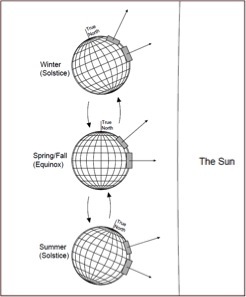 This happens twice each year: at the spring and fall equinox. A solar panel laying flat in New Jersey (41° latitude) would never actually receive direct sunlight. Even at noon in the middle of the summer when the northern hemisphere is tilted towards the sun, New Jersey still isn’t directly facing the center of the sun. Over the course of one year the solar panel on the equator would receive more sun intensity (and would therefore produce more electricity) than the panel in New Jersey. 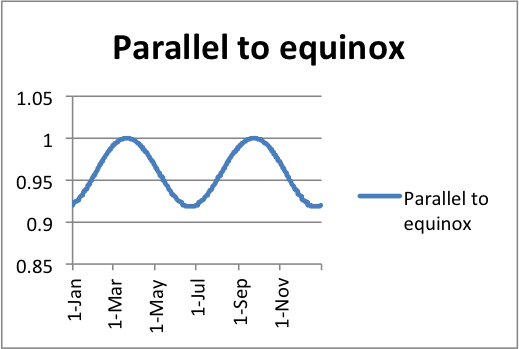 In order to have our New Jersey solar panel receive the same intensity as the panel on the equator, we would need to tilt it so that it is parallel to the panel on the equator. 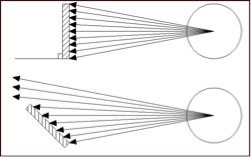 This would cause the sun’s rays to strike both panels at the same angle, with the same intensity (see next image). toward/away from the sun[i] the solar intensity will be around 92%. 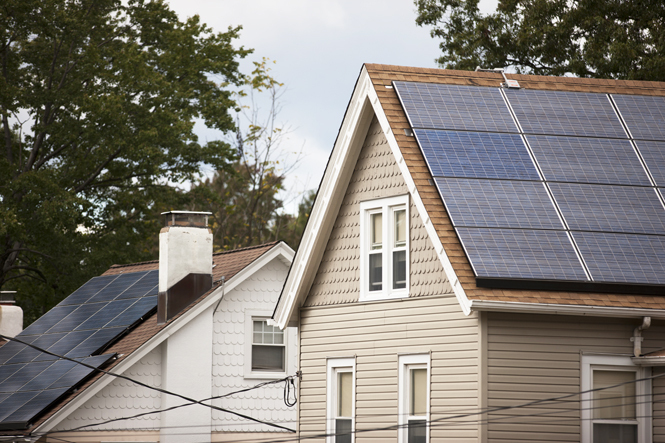 Understanding how a roof tilt might affect solar power production is important in determining the efficiency of a solar design. There are other factors that need to be considered as well: shading, roof azimuth, hardware, electrical consumption, and voltage drop. Each of these factors affect the performance of a solar array. 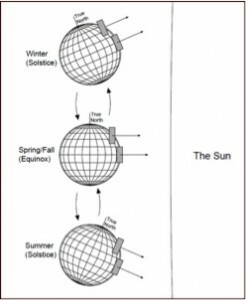 [i] When the sun is tilted towards (summer) and away (winter) from the sun, the solar intensity is theoretically the same. The difference in solar electrical production will be because of difference in number of hours in a day. Because the summer days are much longer than winter days, electrical production will be higher in the summer even though the solar intensity is the same.